Sugar is a substance frequently used to sweeten desserts and beverages. 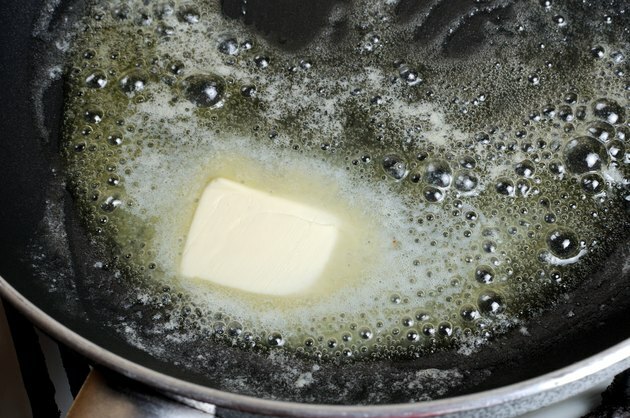 Although sugar is known to be high in carbohydrates, this should not concern you if you caramelize it with butter, since a little goes a long way. Caramelized sugar and butter is a delightfully sweet syrupy liquid that tastes best in small amounts, such as drizzled over cake or fresh fruit. Although sugar can be caramelized without any added ingredients, caramelizing sugar with butter will give the resulting syrup a creamier texture. Place the sugar and the butter into a saucepan set over medium heat. Stir the sugar and butter together with the soup spoon to thoroughly combine the two ingredients. Keep stirring the mixture as the butter melts. The more the butter melts, the easier it will be for you to stir the sugar into the butter. Scrape the sides and the bottom of the pan with the spoon as you stir the ingredients to prevent them from sticking to the pan. You will see that as the mixture continues to cook, it will become thicker and tackier, and it will start to stick to the pan if you stop stirring, so stir the sugar and butter consistently. Continue to let the sugar and butter cook for about three to four minutes, until the mixture has a texture similar to that of molasses. Hold your spoon up and allow the caramelized sugar and butter to drip into the pan to make sure the sauce is not too watery before removing the pan from the stove. At this point, the sugar and butter mixture should start to boil. Add 7 tbsp. freshly squeezed orange juice to the pan during the last minute of cooking time for additional flavor. Serve over a mix of cooked chopped carrots and bok choy. This recipe will result in about 1/4 cup of caramelized sugar and butter. Fill the small pan you used to cook the caramelized sugar and butter in with hot soapy water immediately after removing the mixture to make washing the pan easier. Start scrubbing the pan with a scouring pad right way. If you have difficulty removing the sugar with the scouring pad, scrape the pan with a metal spoon. Caramelized sugar and butter can be very difficult to remove once it hardens. Keep a vigilant eye on the ingredients in the pan as they cook to avoid burning the mixture.